Learn how the landscaped was shaped in Highburton. The circuit around Highburton demonstrates perfectly the idea that being low down within a river bed to will allow you to see bedrock geology, and being high up will enable an understanding of the context within a landscape. This walk will see you encircle a valley that lies to the North of Highburton, starting with the elevated views found in the village, past the disused railway and down to the river bed of Beldon Brook. Standing on the plateau of the Kirkburton Sandstone, you depart from Highburton village and descend down a hill, which has a prominent ridge running across it. This is a resilient sandstone bedding plane that you can see following the hill side for quite some distance, and has been quarried at various locations for stone and for an important coal seam calledThe Better Bed Coalthat is around 1 meter thick. This ridge demonstrates the nature of a bedding plane; that vertically the sandstone is very limited, but laterally this layer of sandstone is extremely extensive. This is important in planning a quarry. Since this walk is a circuit, theoretically you should walk across this layer of sandstone again on the other side of the valley. See if you notice when. Through the trees you may see a river, and some exposed rock. Unfortunately, we cannot go too near this exposure, but this is the Grenoside Sandstone and being at 100m above sea level, it is the lowest unit of rock of thegeological columnthat can be seen on the walk. This rock is an economically important unit that was quarried locally as a high quality stone for public buildings, and was described as having a subtle blue hue, indicating the presence ofreduced iron. If you continue around the circuit, following the map through the woodland, you will descend through a meadow into a meandering river valley, to find Beldon Brook once again. This time, the river has carved out numerous accessible rock exposures, and we can see the bedrock geology at close range. This rock is the continuation of the sandstone ridge that you saw earlier, and in geology, matching up rock of the samehorizonin different locations is known asstratographic correlationand is vital in geological mapping. At this locality the exposed rock is again the Kirkburton Sandstone, and is known for its sparkley appearance. This is due to the high proportion of the mineral muscovite mica, which is used diversely both for decorative glitter and for fireproofing.Palaeogeographersalso can deduce that a preponderance of this mineral indicates the sediment was transported here from a mountain range in to the west, unlike much of the sedimentary material in the region, which came from the newly uplifted Caledonian mountains to the North. Notice the path the river takes in this location. 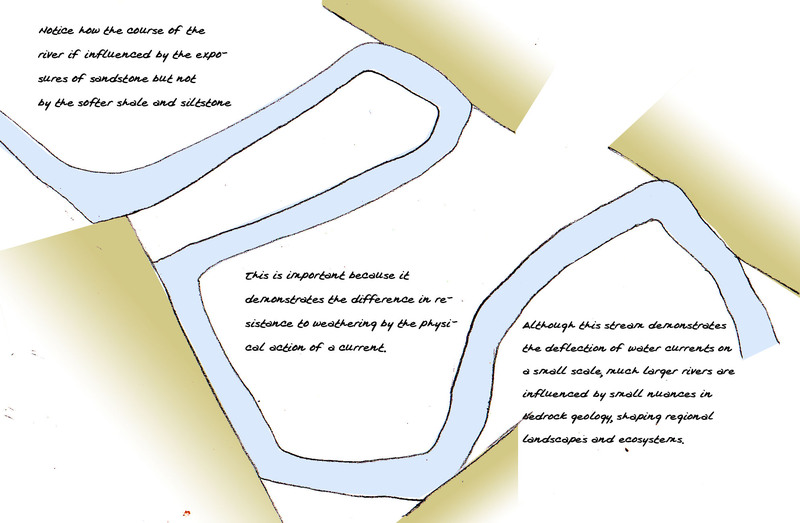 There is a sequence of acute meanders which makes for a sinuous course taken by the river, as the water deflects off the rigid exposed sandstone and changes direction to follow the less resilient mudstone. If you look carefully, you will also see a very old disused mining adit that enters the hillside above the river. From certain angles you can see the shaft is extremely long, and will eventually reach theBlack bedcoal seam that is buried beneath the overburden. As throughout much of the Lower Coal Measure to the East of Huddersfield the geology here was ideal for mining because of the regularity of the seam depth and the shallowinclinationof the bedding; meaning both finding and extracting the coal was easier. As you walk back westwards towards Highburton village, keep a look out for fossilised plant remains that can be found in the dry stone walls. Masons would discard building stone that contained fossils, as they could cause structural weaknesses. This is why the dry stone walls of West Yorkshire often contain this discarded stone that is replete with carboniferousCalamitesfragments. You may also see some slabs near the stiles that show ancient river ripples marks, preserved when they were buried by subsequent layers of sand.